One of many vitriolic anonymous letters sent to Lindy Chamberlain after her daughter Azaria’s death. "YOU should be hung up to the nearest tree, 99.5 per cent of the people know you are guilty," reads one letter. "You are a wicked b***h and your husband isn't much better," says another. 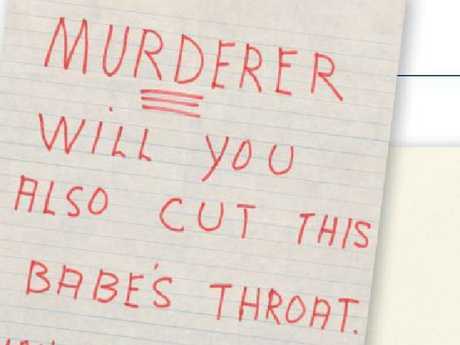 "Murderer - will you also cut this babe's throat? You deserve life with hard labour," reads a third written in big red letters, dropped through this woman's mailbox while she was pregnant with her second child. 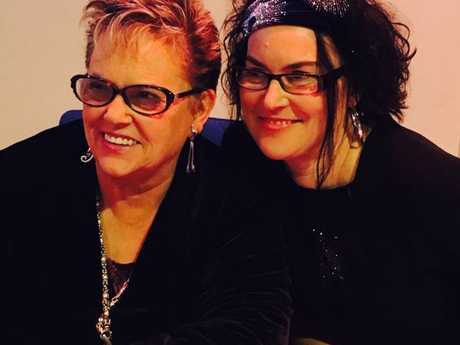 The expectant mother receiving these vicious notes was Lindy Chamberlain-Creighton, Australia's most divisive parent, who shared many of the 30,000 missives she received in the 35 years since the death of her baby Azaria with author Alana Valentine. "She always still seems to be on trial," the author of Dear Lindy: A Nation Responds to the Loss of Azaria told news.com.au. "People come and ask what happened that night, it's incomprehensible." Lindy’s nine-week-old daughter Azaria was snatched by a dingo at an Uluru campsite and never seen again. Valentine says one of the worst things she saw during her research was a T-shirt printed in Darwin when Lindy's daughter Kahlia was born. "Watch out Kahlia," it sneered. "Mummy's coming home." 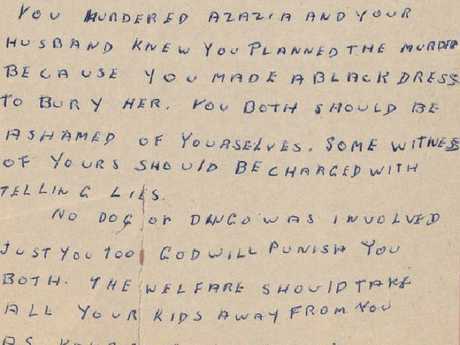 Valentine's annotated book of letters sent to Lindy over the decades lays bare how Australians have treated the 69-year-old since her nine-week-old daughter Azaria was taken by a dingo at an Uluru campsite in 1980. 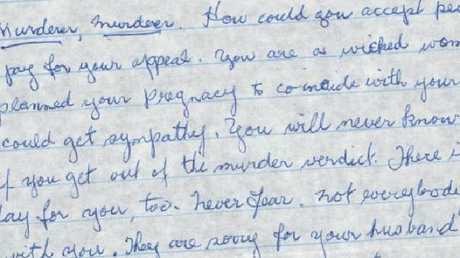 Even after she was exonerated and pregnant with her following three children, Lindy received shocking notes from the Australian public. Azaria's body has never been found, but her torn jumpsuit and clothes were discovered near the rock a few days after she vanished. Lindy, who claimed a dingo had stolen her baby, was found guilty of murder in 1982 and husband Michael Chamberlain was judged to be an accessory after the fact. She was jailed for life and he received an 18-month suspended sentence. 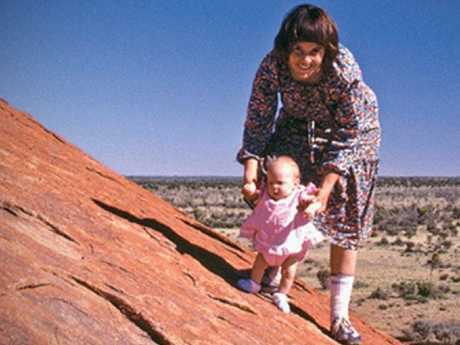 In 1986, Azaria's matinee jacket was found in Uluru, supporting the Chamberlains' defence case, and Lindy was released. But many Australians still didn't believe in her innocence, with her suffering becoming a punchline. One letter informs the grieving mother of the jokes schoolchildren had made up about her. "What did the doorbell say to Lindy Chamberlain when she answered it? Dingo, dingo, dingo." The mother of four has been sent around 30,000 letters since her daughter vanished in 1982. Other notes published in the book predict that her son Aidan would turn against her when he grew up. Many attacked her as "greedy" or "conniving" and pointed to her apparently comfortable lifestyle as evidence of guilt. "If you are so poor, why have you got so many clothes?" wrote one letter. "Killing Azaria made you a millionaire." Some demanded she admit to murder, describing in gruesome detail how they believed she had killed her daughter, slitting her throat or putting her in the septic tank. "May God commit your soul to Satin [sic] (the Devil), for torture in Hell throughout eternity," one letter-writer told the Seventh Day Adventist. "They put dumb animals in cages, that is your place," wrote another. Many writers have informed Seventh Day Adventist Lindy she would be punished by God or shared graphic accounts of how they think she murdered her child. But Valentine says it's time we stop asking about Lindy's guilt and "turn the focus on us - why did Australians react like this?" She believes the bizarre theories and vitriolic attacks are evidence of people "who have never experienced loss themselves trying to rationalise what happened." It was not until 2012 that a Northern Territory coroner issued a final report confirming that Azaria was taken by a dingo. Lindy, who divorced from Azaria's father Michael in 1991, has said she does not hold a grudge against the public, the police or the legal system that wrongly convicted her. 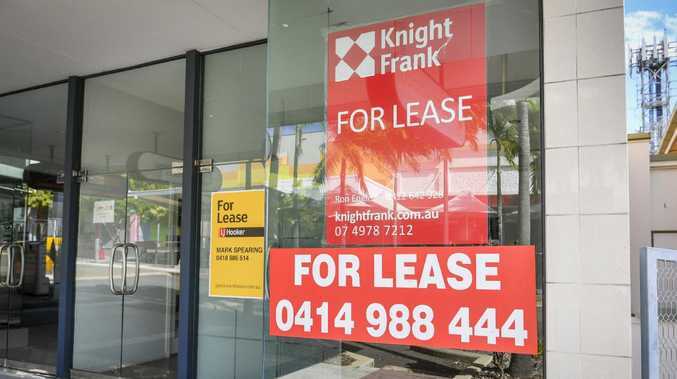 The remarried mother of four told news.com.au in July 2016 that it was her ex-husband she struggled most to forgive. He said he had a different perspective, but wished her well. The 69-year-old, pictured left with author Alana Valentine, says she doesn’t hold a grudge against the public for the years of torment she endured. Michael died in January of this year, after spending years caring for his second wife when she was paralysed by a stroke. "My life - I don't wish it on anyone," he told news.com.au last year. Despite everything the couple went through, Valentine notes that the worst letters were only a tiny percentage, and that Lindy received far more words of sympathy. "I hope people will take heart that there was kindness," she said. A large proportion of the letters are apologies from people who had originally disbelieved her tale. "I am or should I say was, one of those awful people guided by public opinion that you were guilty," reads one letter after Lindy published her autobiography. "Your book made me cry several times. "I apologise on behalf of all ignorant Australians." Another reads: "I was wrong. I am very sorry for any hurt I inflicted upon you and your family. "I am ashamed that I have have never done anything to help you." 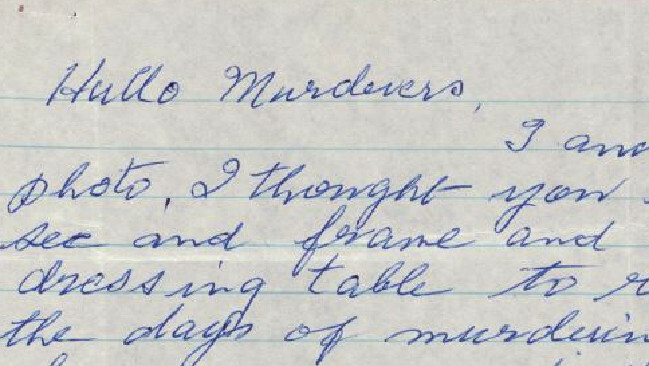 Valentine believes the collection of letters are an interesting display of mass contrition. There are fascinating parallels with the Madeleine McCann case, which saw so many people turn on the lost girl's parents, and Lindy publicly spoke in support of the missing British child's family. The author says the letters have become the bereaved mother's record of her lost daughter. She still receives around 1000 emails every year. "She filed and categorised every one of them, using a star system," said Valentine. "What does it say about her as a mother that every piece of paper related to Azaria she filed? To me, that is the act of a devoted mother. "She didn't perform in the way that was expected. She grieved in her own way." Dear Lindy: A Nation Responds to the Loss of Azaria by Alana Valentine is now available for purchase online for $39.99.